This is something that I originally posted on PentaxForums, but I decided to move it to my personal website. I originally wrote this as a guide for scanning Kodak Ektar, but the method works equally well for all color negative films. Recently I have had quite a few requests to share my method for scanning Ektar, so I figured I would do an in-depth write-up, and try to cover as much as I can. Firstly, I’d like to point out that I don’t in any way claim that this is the “correct” way, it is just my way and I get results that I’m mostly happy with. It is also something that I’m always trying to learn more about and get better results, therefore my method is always evolving. Secondly, I take no credit for coming up with any of this, I’m just using tools built into the software. Thirdly, I think it is important to think of any scan of color negative film as an interpretation of reality. I don’t believe there is such thing as perfectly “correct color”. I use an Epson V500 and the supplied Epson Scan software. I’m well aware of all the “better” scanners and software available, but the Epson works for me. Ektar has a reputation of being difficult to scan. For years, I never shot much Ektar because I always found my results to be wildly inconsistent. I think most of the problems I was having came from using the auto-exposure mode in Epson Scan. There are two main reasons for those inconsistencies. 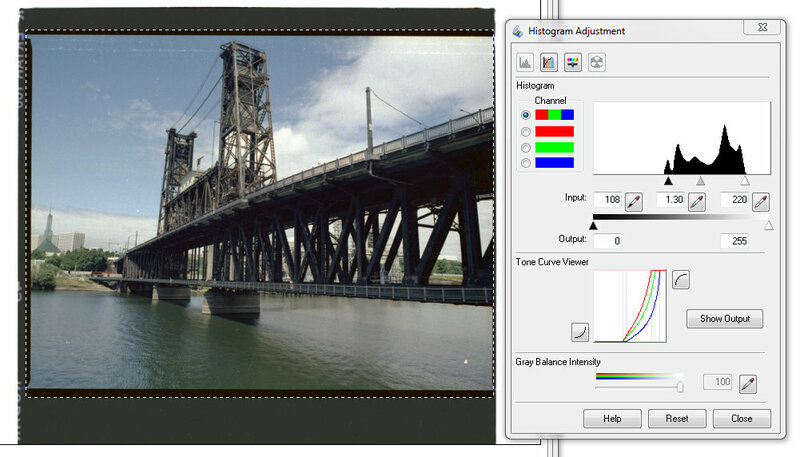 First, the auto-exposure system sets color balance automatically for each frame, and seems to have difficulty finding good color balance with Ektar. Secondly, if you’re using a color profiled system, the preview scan (in auto-exposure mode) is displayed without any profiling (AFAIK), so what you’re seeing in prescan will be very different than the final scan. 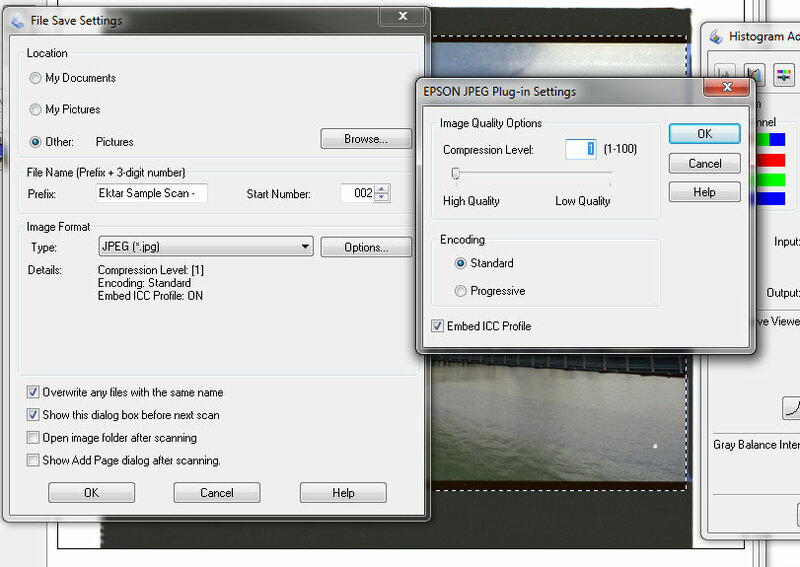 Here is a screenshot of my main Epson Scan window, and all my initial settings. I scan most of my photos as 24bit jpegs, if I have a special image I will scan as 48bit tiff. Note that I have everything unchecked except Digital ICE. Note: Depending on your screen resolution, you may need to scroll down within this dialogue box to be able to access all settings. It’s very important that both “Color Control” and “No Color Correction” are left unchecked. Also, you’ll see that I have Adobe RGB selected as my target. This is because I do all my image processing and printing using the Adobe RGB profile and color space. If you are working in sRGB, or another color space, then you should select the profile that works best for you. Once I have the previous settings all set, and film loaded in the scanner, I do a preview scan. 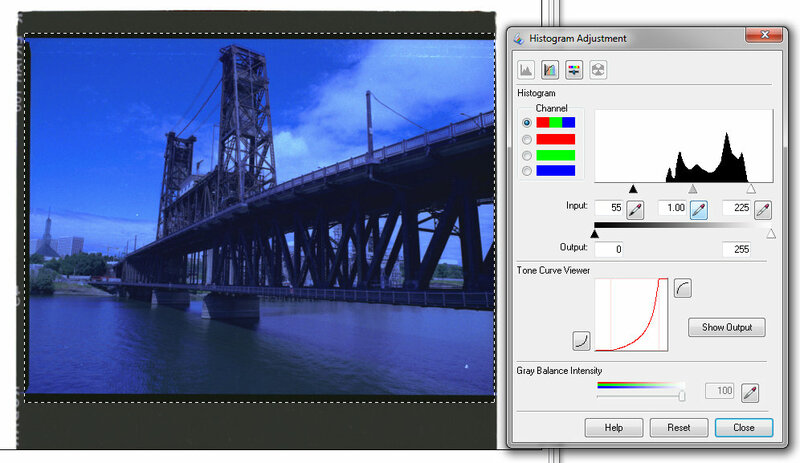 For initial scan settings, it’s nice to have a well exposed negative of a generic landscape with clouds and blue sky, or even a incident metered shot of a color chart or black, white, and grey cards, set in normal daylight. 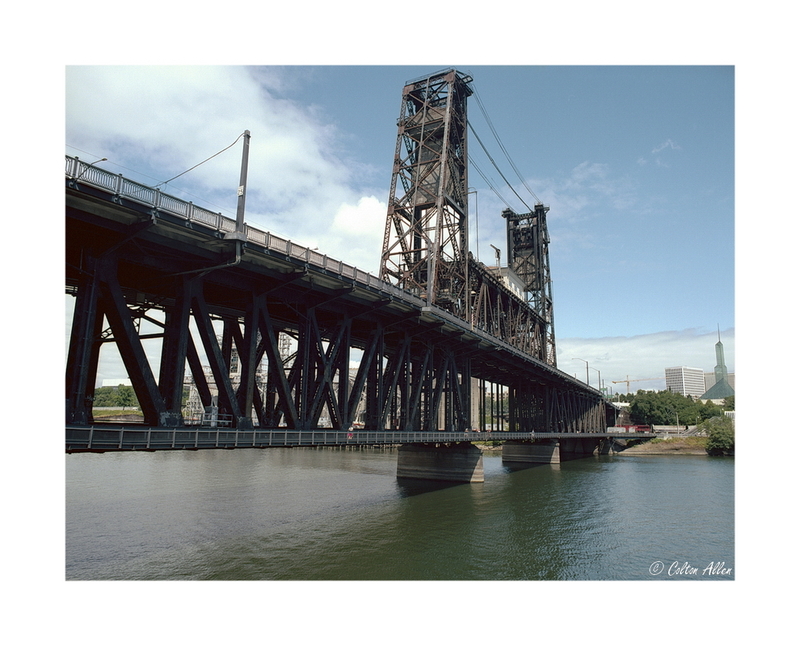 For now I’m going to use a photo I took in Portland a few months ago using my Bronica ETRSi. Once the Preview Scan finishes, I cut a marquee around the frame I want to scan, and then click the Zoom button in the Preview dialog. Here’s my unaltered preview scan,along with the Histogram Adjustment dialog, before I’ve made any changes. You’ll notice that the preview scan looks very flat and boring at this point. The first thing I do at this stage is to make some quick initial changes in the Histogram Adjustment dialog. After that I do an initial Black Point setting. This is done selecting the Black Point eyedropper, and clicking on the unexposed film, just outside the frame. Now comes the trickier part, setting the White Point and color balance. This is why a landscape with blue sky and clouds is nice. Usually the whitest and brightest part of the image is in the clouds somewhere. By using the White Point eyedropper in conjunction with the Desitometer, I look for the brightest pixels (254,254,254), and use that for my White Point. It may take 3 or 4 times, but eventually you should get to a point where there isn’t any clipped pixels. If it worked right, you should have a preview image with a color balance that you like. This part is tricky because some of it is personal preference, and it may be different than you imagined or hoped. For me, this is a good base point to work from. 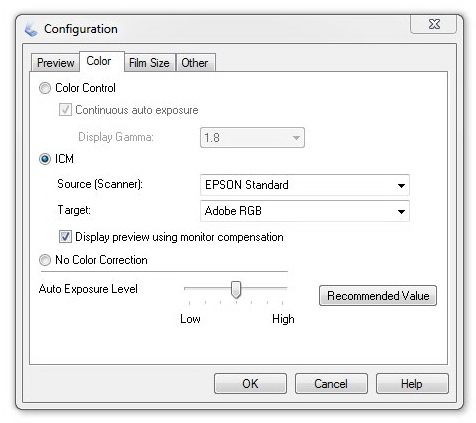 At this stage, I would click on the preview tab at the top of the Preview dialog, and then click “Save” under Settings in the main Epson Scan dialog. I would also start a txt file in Notepad (or similar) and keep track of your Settings since Epson Scan won’t allow you to name your saved settings. Once saved you can use that as a starting point for future scans from the same film/camera setup. I’ve found that I usually have to do a bit of fine tuning from frame to frame, even on the same roll. This particular frame seems a bit dark and contrasty to me, so I brightened it a bit by moving the Gray (Mid tone) Point, from 1.00 to 1.30. You may also find that Ektar has a bluish cast to the shadows, which is common and makes some sense since Ektar is daylight balanced and the color temperature is different in shadows. You may have noticed that my Black Point changed slightly in the last screenshot. What I did was… first I reset my Black Point with the eyedropper and using the darkest, blackest point I could find in the preview scan. By doing this, it fixed the slight color cast, but it moved the black triangle up into the histogram too far, so after I did it, I just moved the black triangle manually to about where it was before. Now I’m ready to scan. Here’s a screenshot of my settings in the File Save dialog. Make sure you open up the Options and set the jpeg quality and also set it to embed ICC Profile. I should note that your final scans using this method may seem a bit flat, especially if you’re used to the auto mode scans. 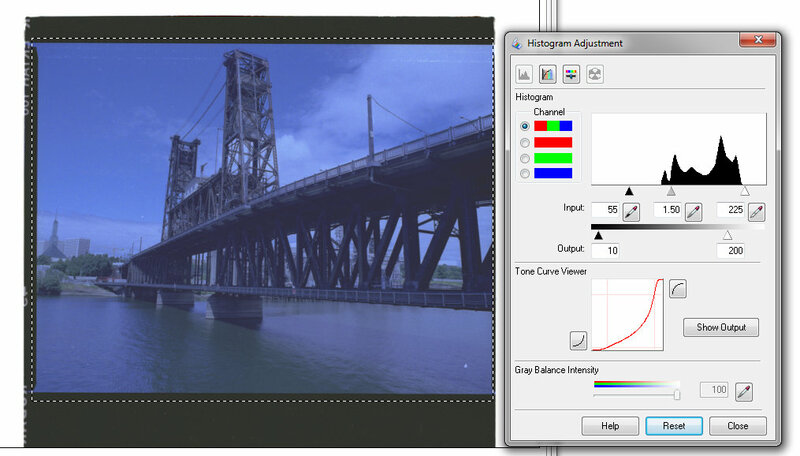 I will sometimes do a levels adjust and apply a tone curve adjustment in post processing.